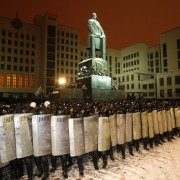 BelarusDigest > Myths > Is Belarus “the last dictatorship in Europe”? Political freedoms in Belarus are severely restricted, especially in comparison with other European countries. However, the authorities are a long way from controlling all spheres of society, as would happen in a totalitarian state. Elections, however, are not free and fair. There is no separation of powers between the executive, the judiciary, and the legislature. As a matter of fact, all political decision-making is either made directly or on behalf of the presidential administration. The Belarusian authorities put significant effort into silencing alternative sources of information not under their control. Although the Internet is currently accessible in Belarus almost without limitations, there is virtually no freedom of expression in the newspapers or electronic media. In addition, the websites of opposition parties are often subject to hacker attacks, believed to be initiated by the state. Opposition parties formally exist, but in practice they are prevented from any substantive participation in political decision-making, such as being elected to parliament or other representative bodies. At the same time, people are free to travel abroad. Criticizing authorities in private discussions or in publications has no harmful consequences most of the time. However, the most active opposition activists and journalists are often fined or sentenced to jail. Participation in an unauthorized demonstration (most opposition demonstrations are not authorized by the authorities) may result in 5-15 days of police detention or a fine. Following the 19 December 2010 presidential elections, political freedoms have been further restricted. Over a dozen opposition leaders, including former presidential candidates, have been prosecuted for protesting against falsification of the election results. Several of them were sentenced to several years in prison.